By the grace and the guidance of Sadguru Aniruddha Bapu, the inauguration ceremony of the Gurukul was performed on the 4th of October, 1998. 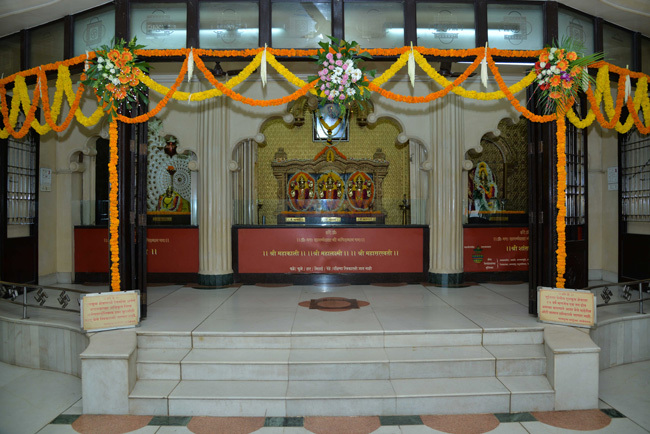 On 28th & 29th of April, 1999, the very sacred occasion of Vaishakh Pournima, Sadguru Aniruddha installed the idols of Mahakali, Mahalakshmi, Mahasaraswati, Shree Mangesh and Shree Shantadurga in this teerthkshetra. During the two days of the event continuous chanting of extremely sacred mantras took place. The idols of the Gods were sculpted out of the sacred stone from the riverbed of river Gandaki. Sadguru Aniruddha Bapu installed the idols in the Gomukh-shaped (Cow’s mouth) area. Everyday at dawn, it is opened and 16-step ritual worship is performed of the three idols. Then the idols are dressed up in great finery. The three idols depicted – Mahakali representing Kaam (desire) as the one of the Purushartha (object of human pursuit) meaning the willpower, She is the one who scares the Asuras and protects devotees, Mahalakshmi representing Artha (money matters) as one of the Purushartha, She destroys all the obstacles, and Mahasaraswati representing Dharma (righteousness) as one of the Purushartha­, She keeps sickness away and keeps devotees healthy. Facing these three idols, we can see two lions made from Panchadhatu (alloy of 5 metals). These have been made on very definite scientific and spiritual criterion. The lions are named as Alhad – blissful delight and Santosh – satisfaction. The column to the right facing Shree Shantadurga has a pitcher inside it. The pitcher or kalash contains the soil from 30 Shaktipeeths and Dharmpeeths across India. Due to all these features the Gurukul is an extremely sacred place. The day when the above idols were consecrated, Sadguru Aniruddha Bapu also installed the Dharmchakra in presence of his Nityaguru, Shree Makarand Swami. The wheel is made of metal and has 24 serrations. The Dharmchakra was energized and activated by continuously chanting of “Om Sai Shri Sai, Jai Jai Sairam” at homes of 52 devotees, three days being the tenure of stay at each home. Sadguru Aniruddha Bapu’s Sadguru in human form is Shree Vidyamakarand Gopinathshastri Padhye i.e. his great grandfather. He was of sharp intellect and was fluent in all the Vedashastra. He was a great Sai and Vitthala devotee hence devotion is given top priority in this study room. Reciting of mantras, chanting name of God, reading of holy scriptures and meditation can be done in this room. The sacred fire was lit here by the grace and blessings of Shree Aniruddha at the inauguration. The fire is kept burning without any break since that day. 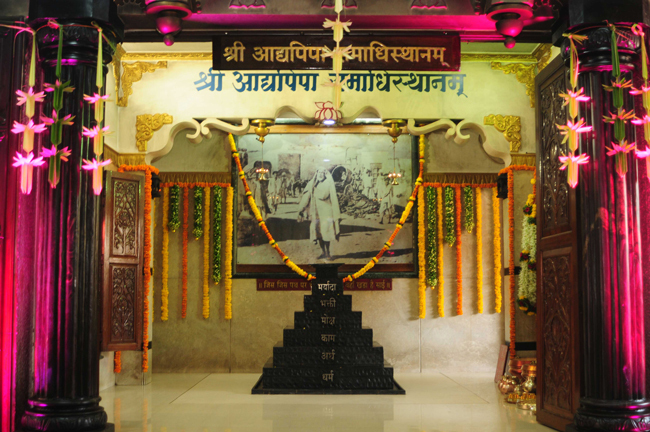 The Samadhi of AadyaPipa was installed on 19th April, 2007 as per the instructions of Sadguru Aniruddha. Urns of Udi given by Sadguru Sainath himself to Aalong with the ashes of his mortal remains are kept in the Samadhi. The Samadhi has 6 steps representing 5 Purusharthas – Dharma, Artha, Kaam, Moksha and Devotion and the 6th step is of Maryada Purushartha the Purushartha is equipped by Bapu. On the top platform above the six steps, the copy of Sai-Satcharita which AdyaPipa used to read regularly is kept. Every year in the month of Shravan, Ashwattha Maruti Pujan on the first 3 Saturdays is performed at Gurukul. Also, Lalita Panchami festival in Ashwin Navratra and Vaibhavlakshmi festival in month of Margsheersh are celebrated here. The Datta Yaag, Venkatesh Yaag and Ganesh Yaag are also performed here everyday other than the new moon days.